This article will help you decide if medical billing outsourcing is the right choice for your practice and how to get the most out of your medical biller and protect yourself at the same time. Medical billing outsourcing makes sense for many types of practices. It reduces payroll costs, overhead expenses, and should improve your reimbursement. Some specialties are more difficult to bill for because of complex coding and/or high rejection and appeal rates. If so, the medical biller needs more expertise and, therefore, a higher salary. You may reduce your payroll cost by hiring a biiling service. Sometimes, logistics is a consideration. I've seen many medical offices where the interuptions make it difficult for the biller to get their most important task done: making collections calls. Perhaps the office setup does not afford a quiet location. Depending on the type of practice and number of providers, it can be a challenge to find the right "staff mix." I discuss this more in office personnel management. A medical office is a very busy place. The goal is to have employees busy but not overworked to the point of burn out. For a very small one provider office, it's close to impossible for one employee to handle phones, authorizations, filing, scheduling, labs, x-rays and the medical billing too. When a medical practice is short staffed, the job that doesn't get done is insurance followup and patient collections calls. I can't tell you how many times I've seen providers write off hundreds of thousands of dollars in insurance and patient accounts receivable. It's a shame because it doesn't have to happen. A large medical billing service is not necessarily better than a small home based business. You might get a low rate but you get what you pay for. Larger services have management staff to pay and are not as responsive as a smaller billing service. I have personally worked with many excellent, very professional sole proprietor medical billing services. They are hardworking dedicated people and they want your business. They may work alone, with a spouse, or several employees. When a practice considers medical billing outsourcing, one of their biggest worries is what if something happens to the medical biller? This is a valid concern but most medical billers have experienced people that can back them up. Naturally, if you have a busy 5-10 doctor practice, you will want to be sure the billing service is well staffed and established. Don't make a decision based on price alone. Most physicians prefer medical billing outsourcing to save money. But they also need to keep in mind, you get what you pay for. Some medical billing services charge a low percentage but they only go after the easy money. You want a medical biller that goes after ALL the money, even the measly $3.00 from a secondary payer that required a rebill and two phone calls. Get references preferrably from someone you know. For some reason, providers tend to make quick decisions that they regret later. Take the time to do the research. If your billing is straightforward, don't be afraid to try out someone new to the business. Many medical billers start out by getting experience in a medical office and then start their own business. They may not have many clients, but if their references are good, you will be getting a conscientious person at a good price. AND, don't be afraid to ask them to do more for you, like special reports, patient birthday cards, format a newsletter, etc. They are looking for business and willing to do more to get it. Find a medical biller that will help manage your practice. Obviously, this needs to be someone local. Many medical billers are willing to do this as long as the hours they spend in the office are flexible. Medical billers can provide many extra services for you like setting up office procedures that improve organization, training inexperienced staff on obtaining authorizations or using a patient scheduler. Host your own data and have the medical biller log into your system remotely. This choice makes a lot of sense when you consider that electronic medical records implementation is becoming more common. Data integration has always made sense but now even more so. It saves your staff time and, therfore, overhead cost. It eliminates data redundancy, your staff can access patient balances, the biller can access chart notes, insurance information, etc. If you choose not to host your data, be sure to get detailed monthly reports and a backup. 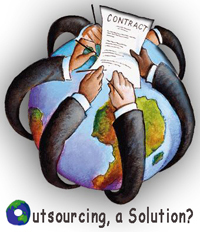 Medical billing outsourcing means you are giving up a certain amount of control. Be sure to ask for monthly reports. You want your biller to know that you are paying attention. It makes them feel more accountable. Your contract should also state that you are to receive a backup of your data or adequate reports in the event you have to complete collections. NEVER change your mailing address to the medical billing service address. Changing your mailing address with your insurance companies is time consuming and a huge pain. If your mailing address is with the billing service, you will be reluctant to leave even if they are not doing a good job. Consider using a lock box instead. I encourage you to analyze your practice to see if medical billing outsourcing is a good choice for you. If we can be of service, please feel free to contact us.